Above figure: Schematics of dye-sensitized solar cells based on (a) disordered networks of nanoparticles and (b) vertically aligned nanotubes. Dye-sensitized solar cell (DSC) is one of the most promising devices for low-cost solar-to-electricity energy conversion. Although an energy conversion efficiency of 11% has been demonstrated for such cells, researchers are still seeking to further increase the efficiency by using alternative sensitizers and redox electrolytes, and to fabricate solid state or non-volatile liquid DSCs. The progress of these efforts, however, is impeded by the disordered structure of mesoporous TiO2 films used in current DSCs. The mesoporous TiO2 films, composed of sintered TiO2 nanoparticles, induce a short electron diffusion length (10-35 µm, determined by the product of electron diffusion coefficient and electron lifetime), which limits further improvement in DSC performance. The disordered porous structure also makes infiltration of solid or viscous electrolytes into the electrodes difficult and ineffective. Synthesis and fabrication of vertically aligned 1-D nanostructure directly on transparent conducting oxides (TCO) has been identified as a promising means to overcome these issues. Recent studies show that photoanodes based on ordered 1-D arrays lead to significantly increased electron diffusion length on the order of 100 µm. This will allow improvement of the energy conversion efficiency by increasing the thickness of the sensitized films or by using kinetically faster redox couples. The vertically ordered structure will also facilitate the filling of solid state electrolyte or ionic liquid into the sensitized films. One key challenge of using vertically aligned 1-D nanostructures in DSCs is that, compared to mesoporous films, the 1-D nanostructures typically have a low internal surface area, resulting in insufficient dye adsorption and therefore low light harvesting efficiency. As a result, the efficiency of the DSCs based on vertically aligned 1-D nanostructures is significantly lower than that of nanoparticle-based ones, although the nanowires allow much faster electron transfer rates than nanoparticles. The work of our grooup has been focusing on fabrication of arrays of long and vertically aligned 1-D nanostructures (which may possess similar internal surface areas as nanoparticle networks) by economically viable methods, integration of such arrays into DSCs, and employment of such arrays to improve the efficiency of DSCs and to replace liquid electrolytes with solid-state or non-volatile electrolytes in DSCs to solve the packaging challenge. We have developed a liquid-phase chemical process for preferential growth of long ZnO nanowires. The process effectively suppresses homogeneous nucleation and prevents formation of ZnO particles in the bulk solution while allowing rapid growth of ZnO nanowires on seeded substrates. 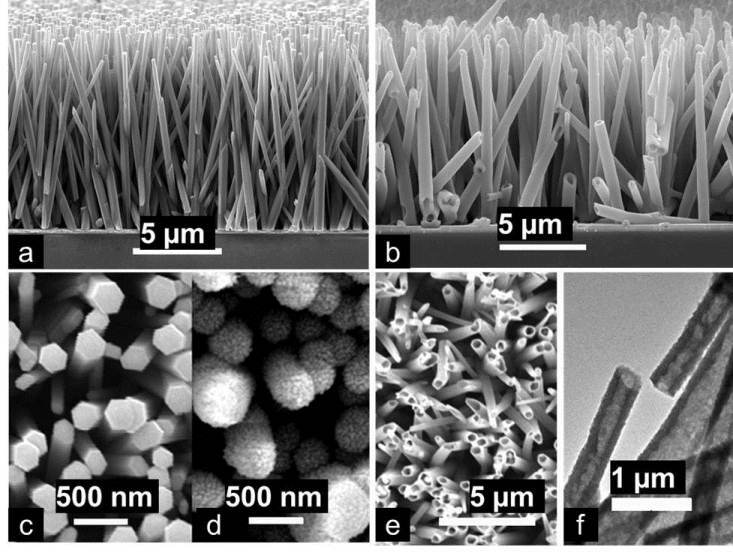 With this process, ZnO nanowires on seeded substrates can grow at an initial rate over 10 times faster than that in the previous process with bulk ZnO precipitation and nanowires of more than 30 µm can be readily obtained within 10 h. The ultra-long ZnO nanowires enable fabrication of dye-sensitized solar cells (DSCs) with up to 33 µm thick sensitizing films (the thickest in the literatures) while maintaining high electron collection efficiency, which results in greatly improved performance compared to previously reported ZnO nanowire-based DSCs. 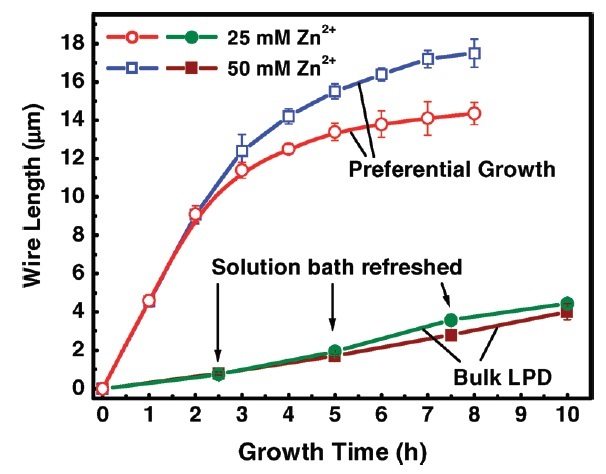 Above figure: Comparison of wire growth by using the preferential growth process developed in this study and the bulk liquid-phase deposition method reported in the literature. The wire length is plotted as a function of growth time at different growth conditions. We have developed a process for synthesizing vertically aligned TiO2 nanotube arrays on TCO through a liquid-phase conversion process using ZnO nanowire arrays as a template. The resulting TiO2 nanotube arrays can be easily integrated with the fabrication process of DSCs and lead to significantly improved photovoltaic performance compared to ZnO nanowire-based DSCs. 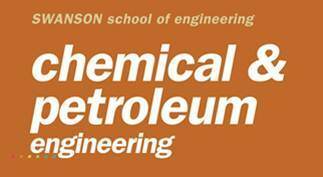 It is also observed that the lifetime of photogenerated electrons in TiO2 nanotubes is more than an order of magnitude larger than that in sintered TiO2 nanoparticles. Above figure: Schematic process for synthesizing vertically aligned TiO2 nanotube arrays on TCO. 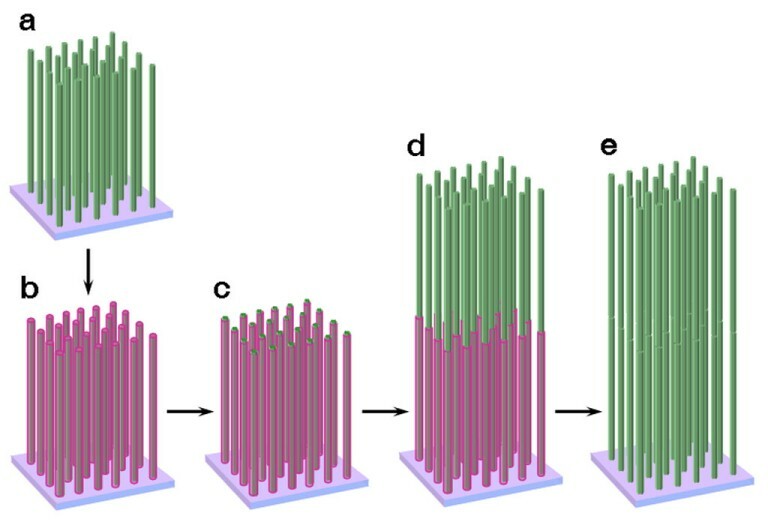 1. growing ZnO nanowire arrays on seeded TCO; 2. converting ZnO nanowire arrays into top-end closed TiO2 nanotube arrays via liquid-phase TiO2 deposition and simultaneous ZnO dissolution; 3. opening the top end of the TiO2 tubes by chemical etching to achieve top-end opened TiO2 nanotube arrays. Above figure: (a) ZnO nanowires. (b) TiO2 nanotubes. (c) ZnO nanowires (top-view). (d) Close-end TiO2 nanotubes (top-view). (e) Open-end TiO2 nanotubes. (f) TEM image of TiO2 nanotubes. We have developed a convenient approach that involves alternate cycles of nanowire growth and self-assembled monolayer coating processes for synthesizing multilayer assemblies of ZnO nanowire arrays and using the assemblies for fabrication of DSCs. 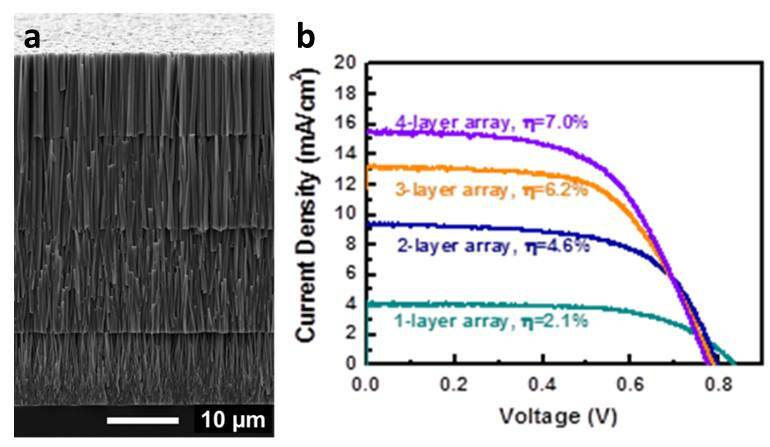 The assembled multilayer ZnO nanowire arrays possess an internal surface area that is more than five times larger than what one can possibly obtain with single-layer nanowire arrays. DSCs fabricated using such multilayer arrays yield a power conversion efficiency of 7%, which is comparable to TiO2 nanoparticle-based DSCs. The ordered structure with a high internal surface area opens up opportunities for further improvement of DSCs. Above figure: Schematic process for synthesizing a two-layer assembly of ZnO nanowire arrays on TCO. a, growing the first-layer ZnO nanowire array on seeded TCO. b, coating the ZnO nanowire array with SAM. c, selectively removing the SAM coating at the top end of the wires while leaving the SAM on the sidewalls of the wires. d, growing the second-layer ZnO nanowire array using the top end of the first-layer wires as seeds, where the aqueous solution is only in contact with the top end of the first-layer wires but is not able to enter the gaps between the wires because of the SAM on their sidewalls. e, removing SAM on the sidewalls of the wires by calcination. Above figure: (a) SEM image of a four-layer assembly of ZnO nanowire arrays. The thickness of each layer is about 10 µm. (b) Photovoltaic performance of DSCs fabricated using the TiO2-coated multilayer assemblies of ZnO nanowire arrays. .